It is an honor to serve as a state legislator from anywhere. But it is a once-in-a-lifetime opportunity to represent this unique district that has served for a quarter century as the conscience of the House. In the 75th District, our bedrock principles include fairness for all Kentuckians, stewardship of the land, and quality, affordable health care available to all. It’s a district where we value educational excellence, accessible public transportation, and soul-stirring art and culture. In Frankfort, I’m standing up for these principles as I also reach out across party and ideological lines to find common ground for the common good. Please let me know your thoughts and priorities. 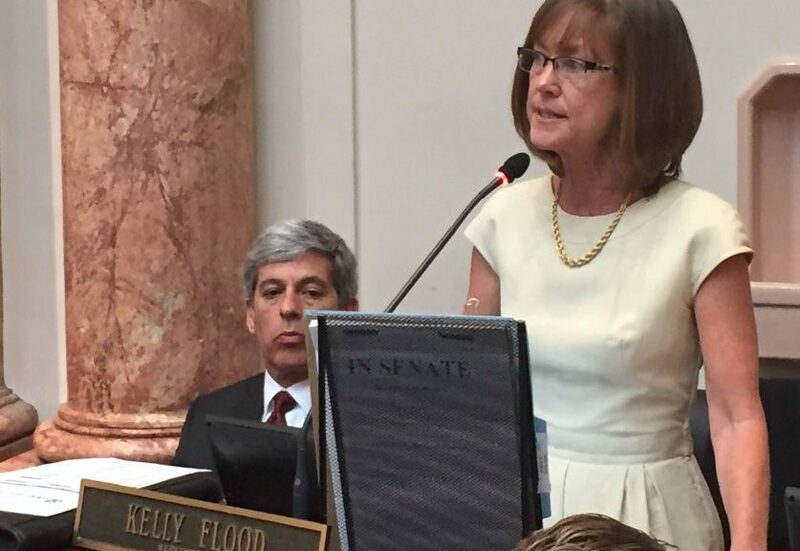 Rep. Kelly Flood, who has been in the Kentucky House of Representatives since January, 2009, serves on Appropriations and Revenue, and the sub-committee with oversight of the pre-K – 12 education budget. She is a member of the Local Government and Natural Resources committees. After graduating from Florida State University in 1981, Kelly immediately devoted herself to progressive political issues. She spent a year on the campaign to pass the Equal Rights Amendment. She served for two years as an aide to a Florida state legislator, and two more at a non-profit consumer-protection agency. Kelly’s early experience in state politics showed her how the levers work. She researched bills, listened to affected parties and helped write legislation. She lobbied legislators and forged compromises. She sat in as the final deals were cut. She learned the importance of combining tenacity and realism to achieve results. In the late 1980s, Kelly felt a call to ministry and attended four years of seminary. She and her husband then chose to make their home in Lexington, where she served as senior minister at the Unitarian Universalist Church from 1991 to 1998. Here, she led interfaith organizations designed to heal divisions among races, ethnic groups, and faith communities. She spoke out forcefully for women’s reproductive freedom, racial fairness, and gay/lesbian rights. For the past decade, Kelly has raised more than $10 million for progressive causes: as vice president for Starr King School for the Ministry, a liberal religious theological school; as an activist and board member for such non-profits as Kentucky Council for Community and Justice and the Carnegie Center for Literacy and Learning; and as a volunteer in the Steve Kay for Council and Barack Obama for President campaigns. Since 1987, she has been married to Neil Chethik, executive director of the Carnegie Center for Literacy and Learning in downtown Lexington. They have a son, Evan, who lives in Chicago, IL. Kelly and her family have lived in the 75th District since 1991. A key legislative goal is to improve the quality and accessibility of public education in Kentucky. This starts with making high-quality preschool available to every Kentucky child. We must also provide support to all of our school-aged children through increased funding for K-12 education, family resource centers, arts and gifted student programs, and professional development for teachers. We must also ensure the University of Kentucky, which is a treasure within in the 75th District, remains our premier public university serving the entire state of Kentucky. This means paying faculty and staff competitively, housing students affordably, and funding research programs adequately. All of Kentucky’s universities and technical schools must be affordable. Rising costs and budget constraints put higher education out of the reach of increasing numbers of Kentuckians. Often middle-class students suffer the most because they are not eligible for any need-based grants and aid. I am committed to finding the money that makes higher education attainable for all Kentuckians. I support the full implementation of the Affordable Health Care Act, or ObamaCare. On the state level, I’m committed to ensuring our health care exchange — where customers seeking health care from private insurers can find the best policy possible — is run by the State of Kentucky. Over 400,000 Kentuckians are without health insurance! It is the right of all Americans to have access to affordable care. I will work diligently for this right here in our state. I also will be an outspoken advocate for access to quality reproductive health care for women across the state. I believe in the dignity and worth of each person. I will oppose racial, ethnic, gender, and religious discrimination, discrimination against people who have different physical or mental abilities, and will speak out against homophobia in all its guises. It is our responsibility to protect Kentucky’s extraordinary natural resources. With good stewardship, we can can build on our natural assets and work toward food and energy independence. The health of our families and the strength of our economy depend on the wise use of our land, air and water. I reject the false choice between a healthy economy and a healthy environment; a cleaner environment means a stronger economy. I will fight to strengthen the laws that ensure Kentuckians have clean air to breathe and clean water to drink. I will work to protect our precious natural resources while advocating their appropriate use to feed our people and meet our energy needs. I will back safe mining practices, and preservation of our mountains and rivers. The arts play a critical role in building strong communities, promoting cultural tourism, strengthening education, and enhancing economic development. As your legislator, I will promote state funding for artists, arts education and organizations that support the arts. Are you in the 75th district? The Kentucky State Board of Elections Voter Information Center has an online form to verify your registration, find your precinct, and view sample ballots. Paid for by the Campaign to Re-Elect Kelly Flood.